I have everything packed and ready for the Art in the Yard sale in Dallas tomorrow: lots of pots, bubble wrap, shopping bags, unsweet tea, a nice shady 10’x10′ awning, etc. It’s going to be a good-looking setup. 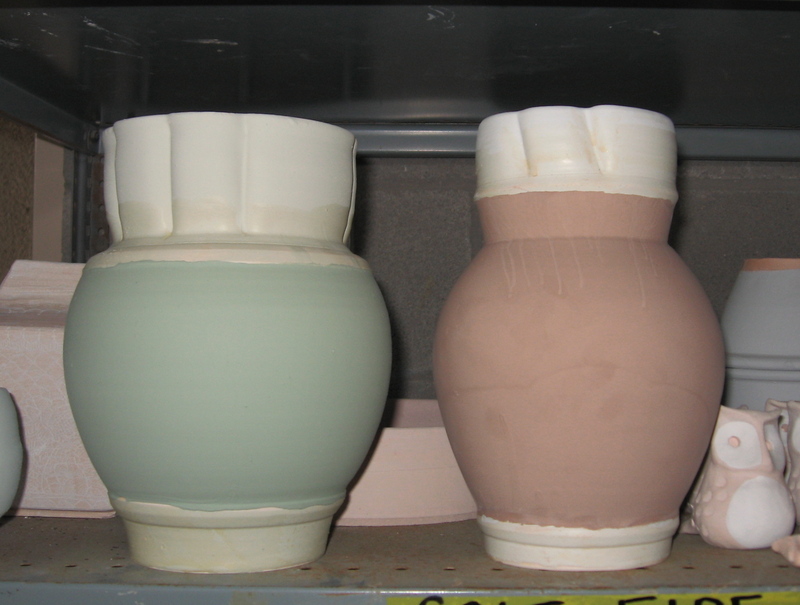 Multi-glaze combinations on some large vases. In preparation for the Craft Guild Spring Show & Sale in Addison during the first weekend of May, I am glazing about 20 more pieces to replenish what I hope will be a depleted inventory of pots. Here’s the majority of them, glazed in my usual limited palette of preferred glazes. 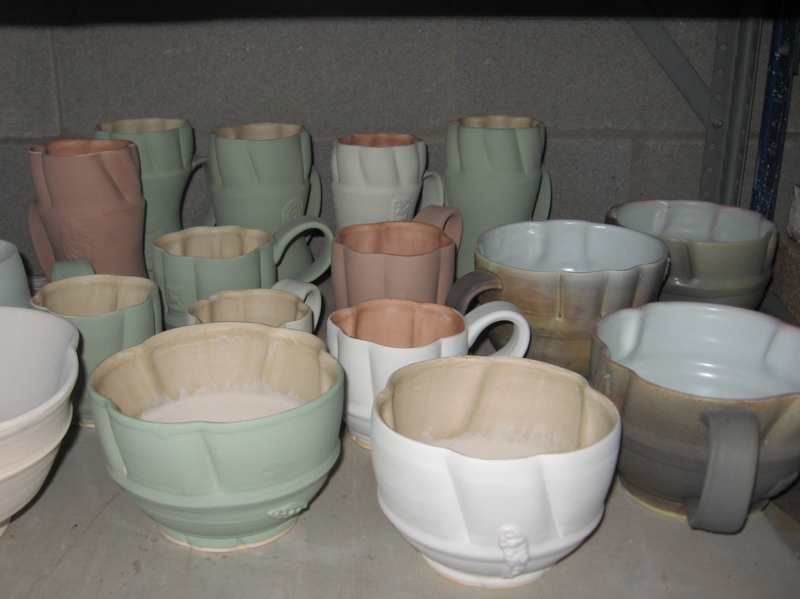 Glazed bisque mugs and bowls with or without handles. 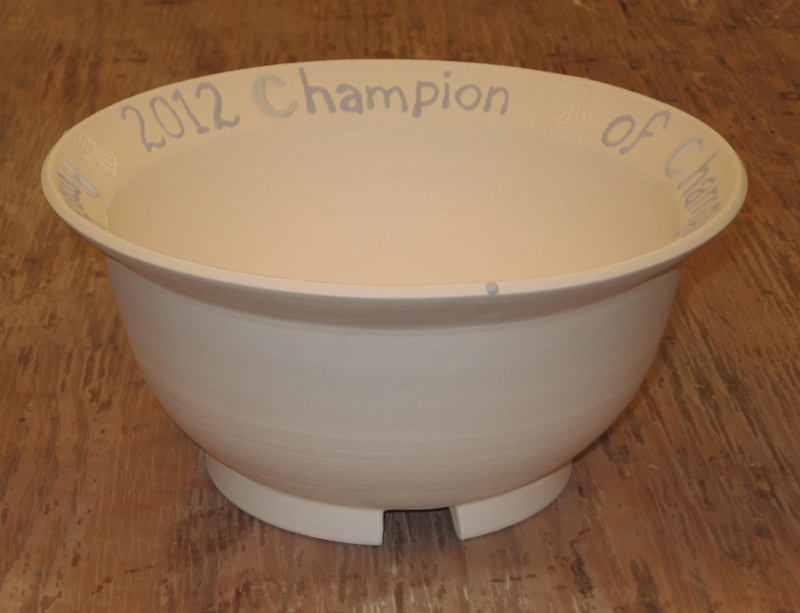 I also have about 1/2 of the trophy bowls bisqued; so far, no cracking or shifting in the slip and sprig decoration. The tripod feet turned out well. 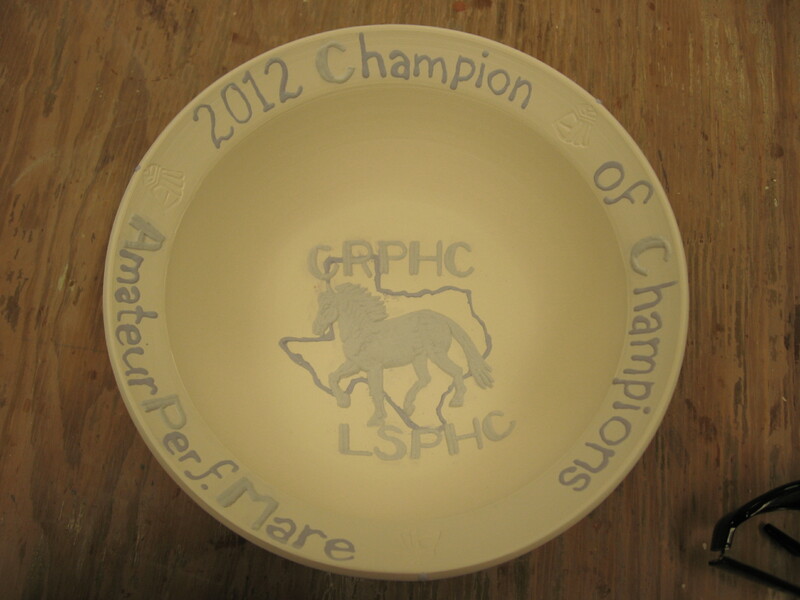 Bird's eye view of one of the horse show trophy bowls. The two shades of blue slip are easier to distinguish at this stage. I hope they’re even deeper and richer after the glaze firing. Aaron and I stopped in at the Craft Guild to check out the reception for the Dallas Pottery Invitational. Well, I had planned to help at the checkout table, but plenty of other helpers showed up and I never got called in to assist. I definitely will on Sunday, though. The gallery felt mighty crowded on Friday night with all of the chatting, laughing, conversing folks milling past the Blue Mesa catering table, courtesy wine and beer bar, and numerous tables laden with pottery aplenty. The live jazz has become a welcome fixture at the reception, creating a lovely blend with hors d’oeuvres and excellently crafted art. Although I managed to abstain from purchasing any new additions to my collection, Aaron actually snapped up a plate from Forest Lesch-Middelton and a mug from Sam Chung. 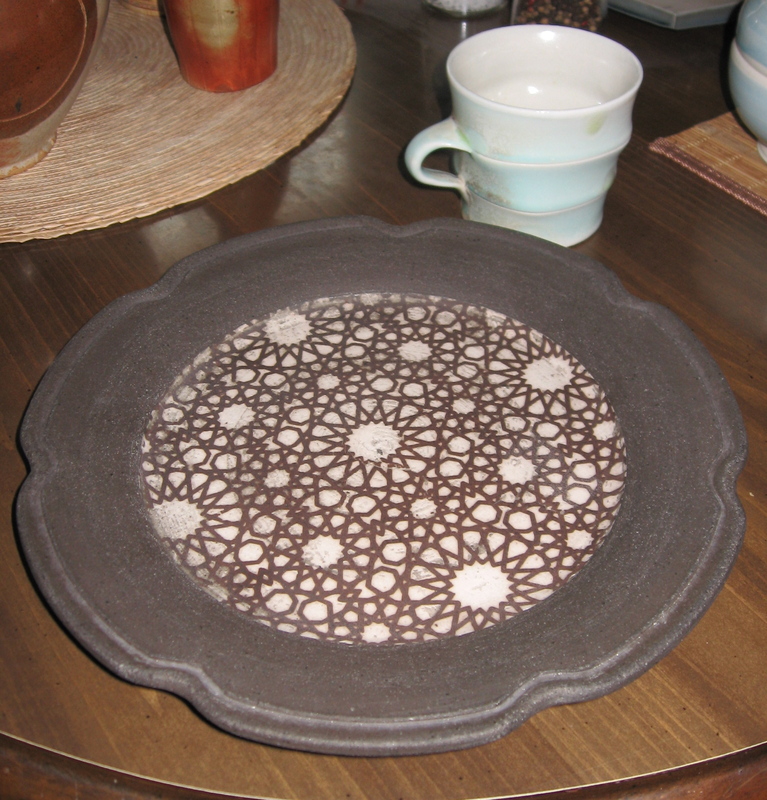 Dinner sized plate by Forest Lesch-Middelton and delicately colored small mug by Sam Chung. Forest Lesch-Middelton starts with a dark, toothy stoneware roughly akin to chocolate in color, then transfers and/or silkscreens patterns onto his elegantly earthy pots. Sam Chung works with a lot of slabs assembled into functional forms in addition to thrown pieces and pots. The small thrown mug Aaron picked has skillfully separated incised lines, and a surprisingly comfortable single-finger handle. 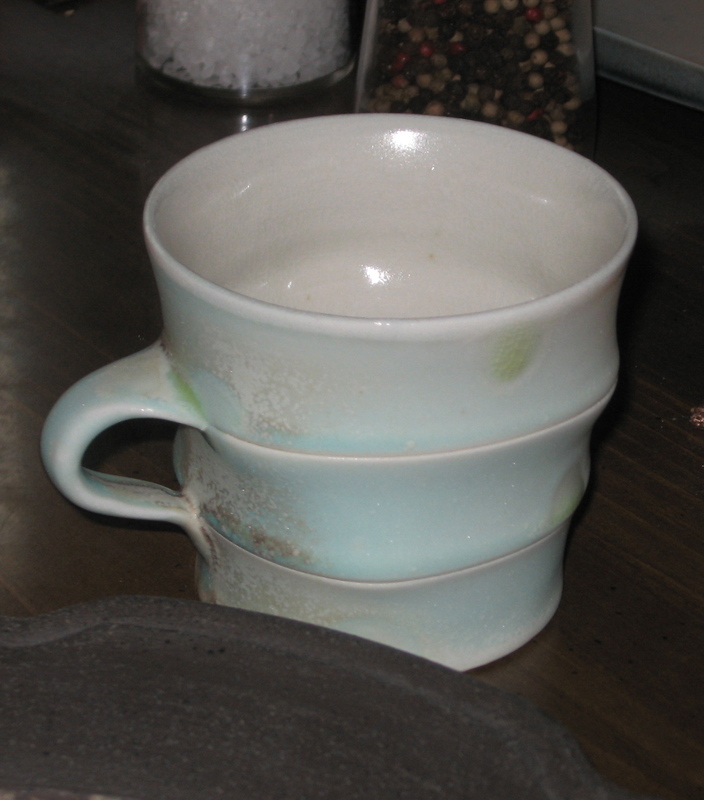 Here's a close up of the Sam Chung mug, complete with shiny dots and minty satin glaze. 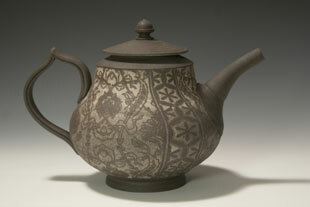 Teapot by invited artist Forest Lesch-Middelton. 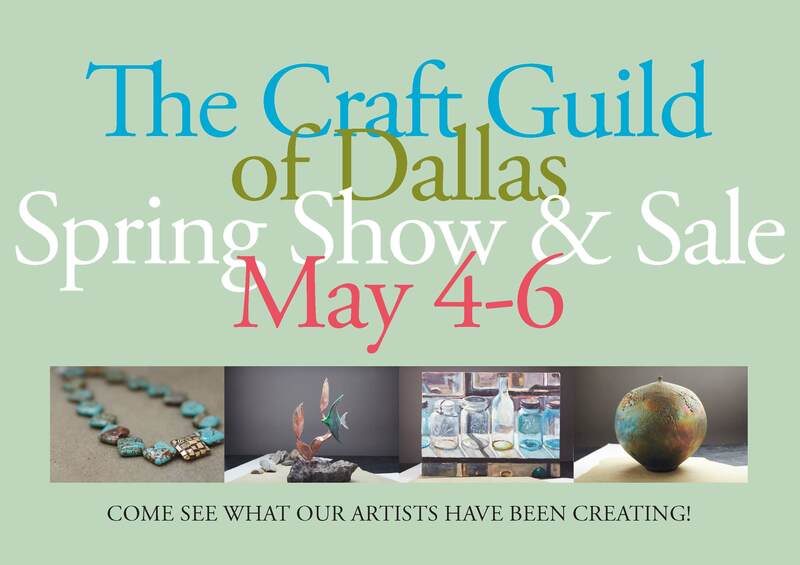 This weekend the Dallas Pottery Invitational is being held in the gallery at the Craft Guild of Dallas, which incidentally is located in Addison. I have volunteered my time to help run checkout or wrap pots during the show for several years now. I plan to help out during the busy reception on Friday and closing day on Sunday. The participating potters who are exhibiting includes Louise Rosenfield, Amy Halko, Gary & Daphne Hatcher, Brenda Lichman, and Lisa Orr in the core artist group with invitees Jerilyn Virden, Forest Lesch-Middelton, Sam Chung, Bryan Hopkins, and Andrew Martin. 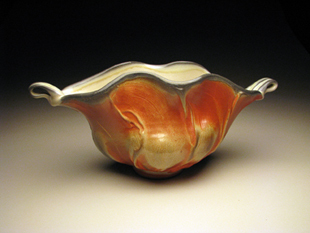 Gorgeous bowl by core artist Brenda Lichman. 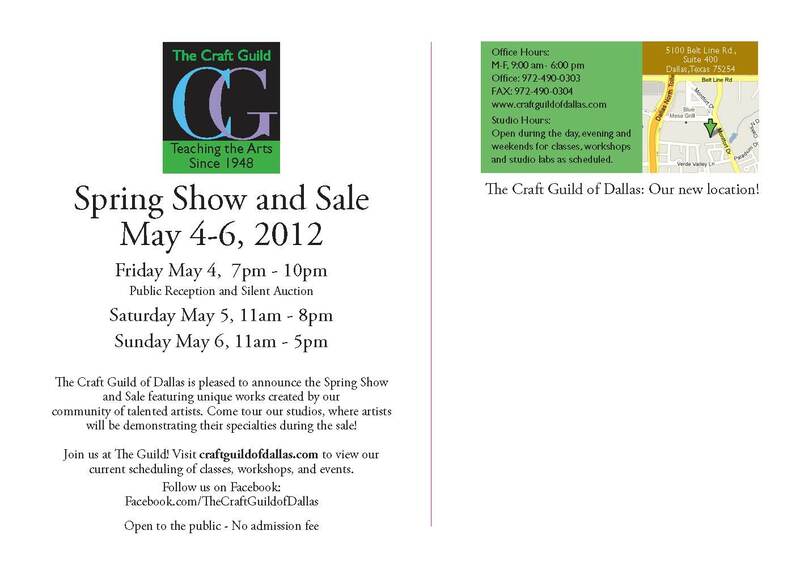 Then the first weekend in May, the 4th-6th, the Spring Show and Sale will be taking place spread throughout the Guild’s studios. I will have a table of my own pottery for sale, along with other potters, sculptors, jewelers, glass-workers, weavers, bookbinders, and painters. 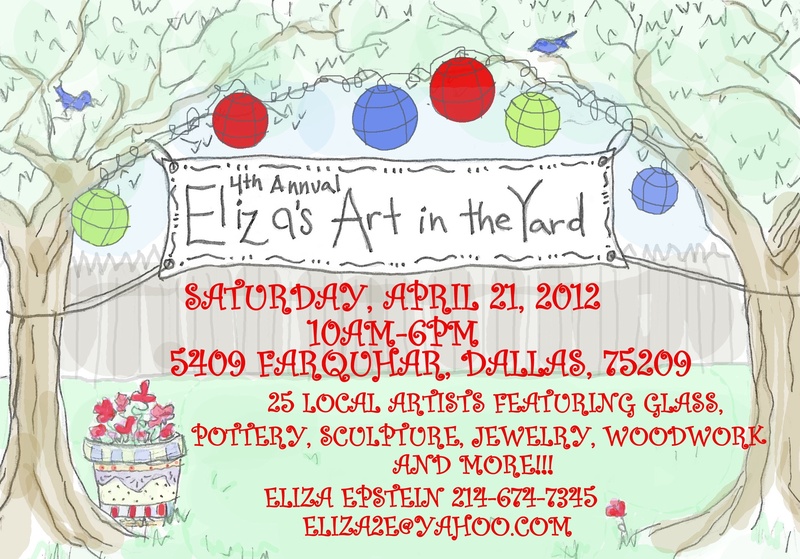 Regarding access to my work, this event follows the upcoming Art in the Yard sale on April 21st. The variety of objects and level of craftsmanship sure to be present at both events will make for excellent looking and shopping, so please come out if you’re into that. This April 21st, on a Saturday, I will be bringing a table out and setting all my current inventory of pottery up for sale at Art in the Yard! My understanding is that there are many different types of craft people who will be in attendance selling their own variety of goods. This event promises to be awesome, despite the single day duration. I will be set up to accept cash or personal checks for payment, and maybe Paypal via smartphone. If you want to pay via Paypal, just be aware: I will add their transaction fee to the total price + tax. I would love to see you, so save the date and try to make it out! Also, this will be the public’s first opportunity to purchase work from my previous and quite successful firing. TTFN!